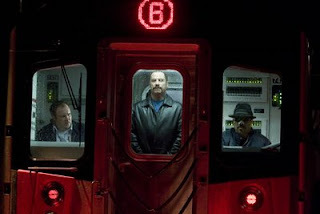 Tony Scott is like the Rafael Palmeiro of filmmaking. Both were mid-to-upper standouts in their respective fields until avarice and self-indulgence persuaded them to artificially – and detrimentally – enhance their innate abilities. For Palmeiro, it was taking steroids for more hits and homers. For Scott, it is the audio-visual gimcracks he has allowed to infect his films the past decade: The jump-cuts, the slow motion, the freeze frames, the oversaturated color schemes, the time-lapse photography, the clanging, hip-hop-lite soundtracks by Harry Gregson-Williams. Its false bravado masquerading as cocksure preening, with little but car crashes and actors yelling at the camera to approximate the illusion of narrative drive. You will quickly realize it is business as usual in Scott’s remake of The Taking of Pelham 1 2 3 when you hear the openings strains of Jay-Z’s “99 Problems,” a six-year-old rap song with no apparent contextual connection to the film. In between herky-jerky images of the New York City skyline and subway system, we glimpse the blurry apparition of Ryder (John Travolta), a tattooed, racist ex-commodities trader making his way underground where he will lead the hijacking of the 6 train from Pelham Bay Park. Denzel Washington (appearing in his fourth collaboration with Scott) plays MTA dispatcher Walter Garber, presumably named in part after Walter Matthau, who played then-Lt. Zachery Garber in director Joseph Sargent’s fondly held 1974 film adaptation of John Godey’s source novel. Garber finds himself in the unfortunate position of ad hoc negotiator with Ryder, who demands $10 million in an hour or he will execute one hostage for every tardy minute. The miscast Travolta never firmly establishes Ryder’s persona: One minute he is a shrewd, diabolical nemesis, the next a ranting, raving lunatic unraveling under the pressure of his hair-brained scheme. Every time the high-pitched Travolta shrieks one of his many MF-bombs, he sounds as if he’s reading them off cue cards. The stolid screenwriting combo of David Koepp and Brian Helgeland meekly attempt to introduce some moral ambiguity into Garber’s character, a device that worked well when applied to Nick Nolte’s protagonist in Martin Scorsese’s Cape Fear remake. But, Garber’s “confession” that he once accepted a work-related bribe comes only under Ryder’s threat to shoot a hostage if Garber doesn’t come clean. If that’s not sanitized enough for you, he also reveals that he spent the bribe money on his kids’ college tuition. Initial police suspicion that Garber might be working in cahoots with Ryder is an intriguing angle that would have added another dimension to the procedural plotline, but it dissipates without comment as quickly as it materializes. So, too, with the discovery that Ryder’s true financial target is not cash but rather stock market manipulation: The last time we hear anything about that is when the city’s mayor (James Gandolfini) announces he is marching down to the SEC to look into any of Ryder’s recent, suspicious transactions. Just a suggestion, I’d say all of them. The film’s banality reaches its nadir when Scott rolls out the most anticlimactic ending this side of brother Ridley’s American Gangster. Let’s just say a crime rooted in intricate planning and cunning execution comes down to one guy walking across an overpass getting caught by another guy running across an overpass. If that sounds exciting, then boy, do I have a bridge to sell you.